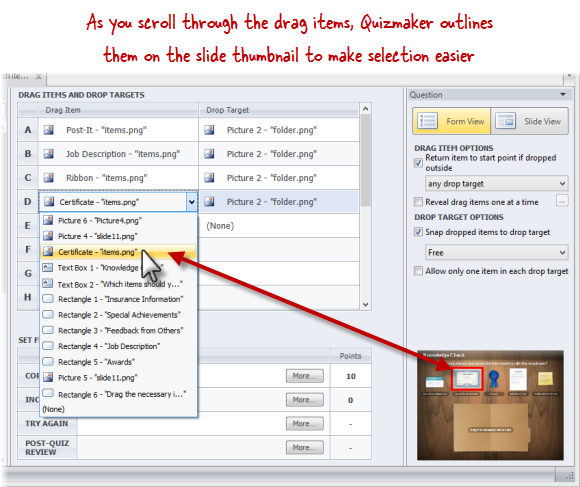 Articulate Quizmaker's freeform drag-and-drop question type lets you add interactivity to objects on your slide. Just indicate which objects are drag items and which are drop targets. 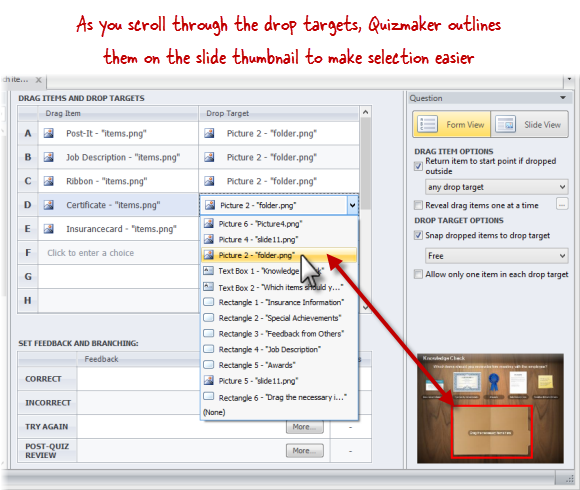 There are two ways to create a drag-and-drop question. If you already have a blank slide with objects that you want to use in a drag-and-drop scenario, you can convert it into a question. (Click here to learn how.) 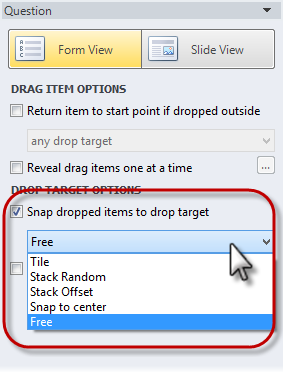 Or, you can insert a freeform drag-and-drop question as described below. In Question List View, go to the Home tab, and click Freeform Question. In Question List View, press Ctrl+Q. In Slide View, go to the Insert tab, and click Freeform Question. In Slide View, right-click anywhere in the left navigation pane, and choose New Question. In Slide View, press Ctrl+Q. In Form View, go to the Home tab, and click Freeform Question. When the Insert Questions window opens, select the Freeform tab in the upper left corner, and click the Drag and Drop thumbnail. Switch to Form View, and proceed to the next step to indicate which objects will be drag items and which will be drop targets. 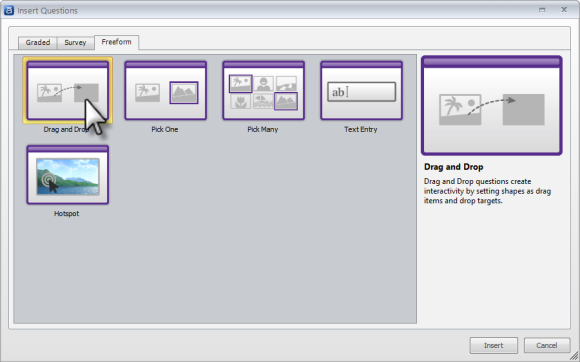 Place your cursor in the Drag Item column, and use the drop-down selector to identify the objects that you want learners to be able to drag. As you scroll over the items in the list, Quizmaker marks them with a red outline on the preview thumbnail in the lower right corner of the screen, so you can easily see what you're selecting. 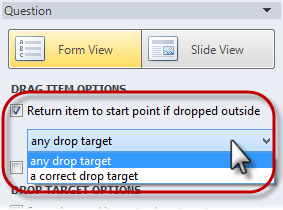 Then place your cursor in the Drop Target column, and use the drop-down selector to identify the objects that are drop targets for the corresponding drag items from the previous step. 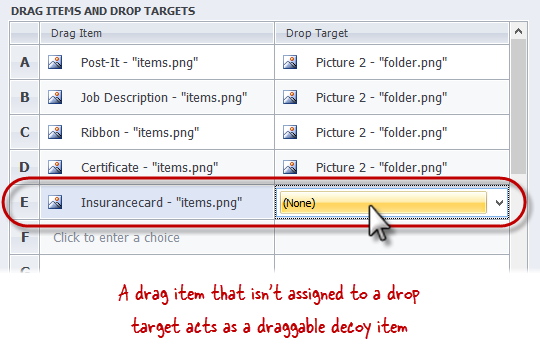 You can make an object draggable even if it isn't part of the correct response (i.e., a decoy drag item). 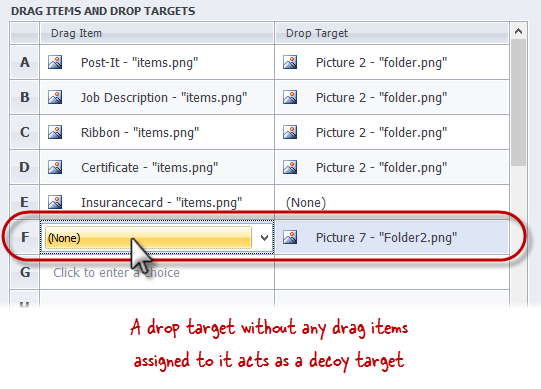 Just select that object in the Drag Item column, and then select None in the Drop Target column. You can also make an object function as an incorrect drop target (i.e., a decoy drop target). Just select that object in the Drop Target column, and then select None in the Drag Item column. 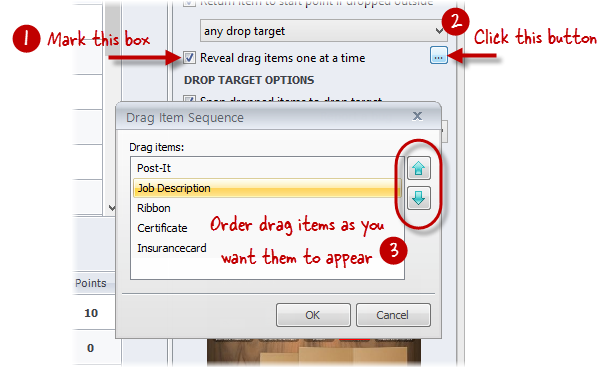 To remove a drag item/drop target combination from the answer grid, right-click anywhere on that row, and choose Delete Choice. In Form View, use the Drag Item Options in the Question panel (on the right side of the screen) to change the behavior of your drag-and-drop question. Reveal drag items one at a time: Mark this box if you want drag items to appear one at a time after the previous drag item has been dropped on a target. Click the ellipsis (…) button to set the Drag Item Sequence. Snap dropped items to drop target: Mark this box if you want drag items to snap to drop targets as learners arrange them on the slide. Then use the corresponding drop-down to choose how items will be tiled or stacked. 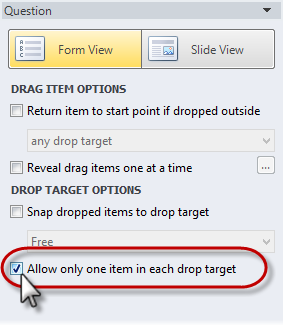 Allow only one item in each drop target: Mark this box if you want to restrict the number of drag items that can be dropped on a particular target to only one. When learners drag a second item onto an occupied target, the first item will be pushed out of the target and replaced with the new item. When you remove freeform from a question, it becomes a standard content slide (known as a blank slide). Text and other objects remain intact. Only question-related properties, such as score and feedback, get removed.